They say a picture is worth a thousand words, unless its a shredded Banksy, obviously, which is worth around £1m. But how to put a value on the majestic artwork Donald Trump was revealed to have gracing the wall outside the Oval Office, as eagle-eyed viewers of 60 Minutes spotted? What is it with the Left and that silly painting? Check out the cola drink by President Trump’s arm. The further Left a person is, the less of a sense of humor they have. And everything that Trump does in fun or jest just drives them crazier than they already are. Its an interesting painting, but the analysis is would have us believe that Trump himself painted it with hidden meaning. The very same painter did a very similar picture of Democrat presidents. It’s no worse than a looney tunes jerk claiming she’s of Native American descent. How exactly is it “bizarre”? I merely depicts an exclusive club of Republican presidents in a humorous fashion. I find it very interesting that the writer takes a very sour & negative angle on everyone, except at the end they seem to express hope in the female character in the background. The writer is just another Hillary worshipper would delights on dumping on every male president. I just checked it out. I personally think it’s great! Notice they are all republicans. I dunno, that painting is a LOT better than those awful portraits of Obama and Mooch. The picture is not “bizarre”. The official portraits of nobama (the Greatest Fraud Ever ) and Michael are “bizarre”. The media is replete with haters and liars . There’s an all democrat presidents painting too. I think it’s cool. But as usual the left’s hair is on fire. Didn’t the original of this had Sarah Palin sitting there? I wouldn't call that Trump painting silly. I'd call it light, and humorous. Something we need more of. Now, here's a silly painting. 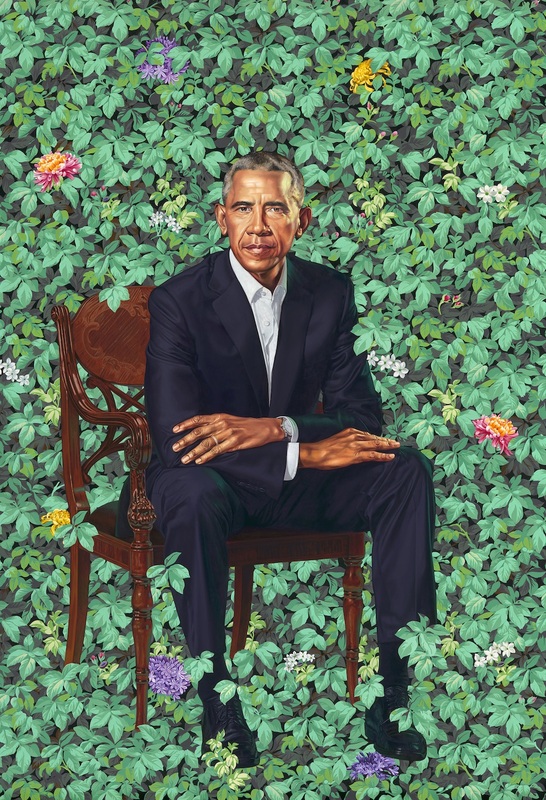 it's Obama's official portrait (really). It looks like he's being slowly attacked by foliage. They have one of the Democrats with Obama.